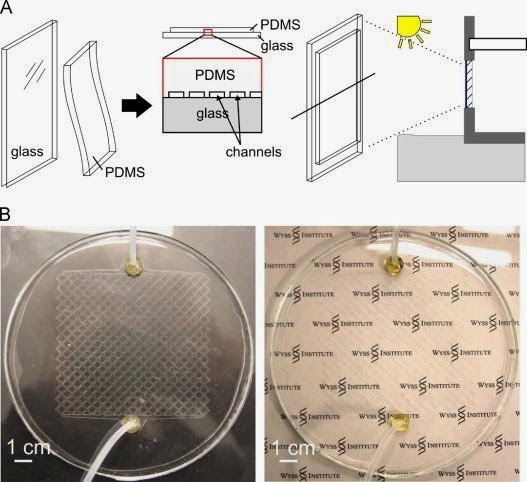 A new type of energy-efficient window — inspired by and recreating the vascular networks found within living organisms — has been created by researchers at the University of Toronto. The new windows work effectively to limit heat loss during the winter and provide a cooling effect during the summer. The new design has resulted in 7–9 degrees of cooling in laboratory experiments. The researchers also think that their new technique/design could be applied to solar panels, working to increase their functional efficiency thanks to the cooling effect. The new process is, in the words of the researchers themselves, a “bio-inspired approach to thermal control for cooling (or heating) building window surfaces,” one that works through the action of optically clear, flexible, elastomer sheets, which are attached and bonded to normal glass window panes. The attached elastomer sheets — which are composed of polydimethylsiloxane (PDMS) — feature ‘channels’ through which room-temperature water is free to flow. It’s this flowing water that provides the thermal controlling effects. “Our results show that an artificial vascular network within a transparent layer, composed of channels on the micrometer to millimeter scale, and extending over the surface of a window, offers an additional and novel cooling mechanism for building windows and a new thermal control tool for building design,” stated Ben Hatton, lead researcher and a professor of engineering at the University of Toronto. As Hatton notes — the new technique could probably very effectively be applied to solar panels, and could also function well as a means of supplying heated water to existing hot water or heat storage systems. The new research was just published in the journal Solar Energy Materials & Solar Cells.